This 5-year-old has always had milk with every meal – so when she noticed that one of her classmates couldn’t afford to buy a carton of her own, she decided to take matters into her own hands. Two weeks ago, Sunshine Oelfke’s grandmother Jackie Sue spotted the youngster emptying out her piggy bank and counting the coins. She then dumped all of the change into a plastic baggy and tucked it into her school backpack. 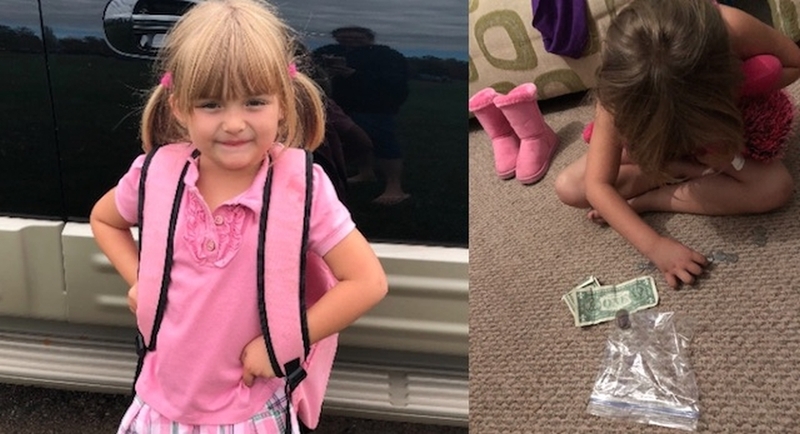 Jackie Sue was confused as to what Sunshine was planning to do with the cash because the kindergartner exclusively uses the piggy bank to store up all of her allowance money so she can one day buy her own snowmobile. When she asked why Sunshine was emptying her piggy bank, she was overwhelmed by the tot’s response. “I’m going to take it for milk money. I’m taking it for my friend Layla,” explained Sunshine. “She doesn’t get milk — her mom doesn’t have milk money and I do. There are 20 students in the 5-year-old’s classat Birchview Elementary School inIshpeming, Michigan – and half of them cannot afford to buy the $0.45 milk cartons for snack time. This means that providing every student in the class with milk costs roughly $180 per month. So, after buying Layla’s milk, Sunshine eventually brought her kindergarten teacher all the money in her piggy bank, totaling up to $30. Jackie Sue and Sunshine then created a GoFundMe page to help raise money for the rest of the school year. Because news of the youngster’s compassion has gone viral, the campaign has surged past their original goal and raised $6,000. “My heart is so full of pride and love knowing that in a world where there is so much hatred, there is a ray of Sunshine with a HUGE heart that – at the age of 5 – LOVES everyone and always wants to help,” she added.